An allergy occurs when a person’s immune system is causing reactions to things in the environment that are harmless for most other people. Allergens are substances to which you are allergic. Allergens are found in house dust mites, pets, pollen, insects, moulds, foods and some medicines. These differ from patient to patient. There is no “one size fits all” list of triggers for people with allergy! One way to test for allergy is through skin prick tests. Allergic people have been “sensitised” to an allergen (e.g pollen) when it enters the person’s body … say through the nose. The pollen triggers the body to make allergy type antibodies, called IgE. 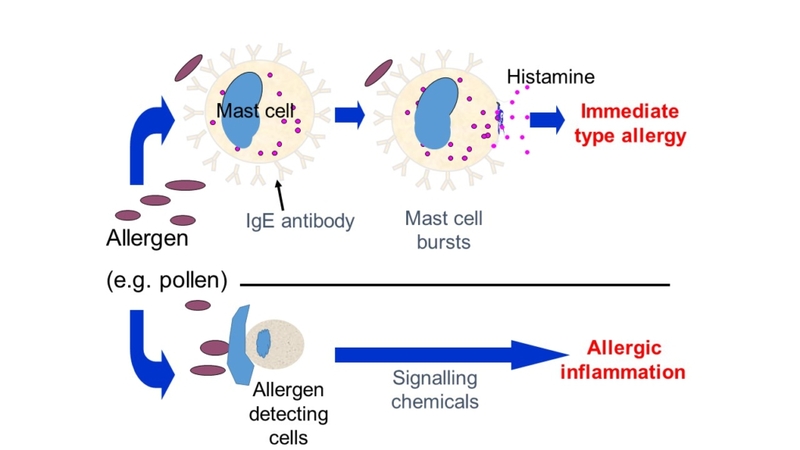 The IgE then goes around the blood and attaches to the allergy cells called mast cells. This person is now “sensitised” and much more likely to have an allergy attack. Skin prick tests (SPT) are an accurate way of checking which substances may cause an allergic reaction. SPTs use your own body to show us whether it has IgE antibodies to the allergens in the skin prick drops. SPT can be used to help with the diagnosis of allergens in the air (that cause hay fever or asthma symptoms) and less commonly are performed to foods. Drug prick testing is done in specialised units. Insect allergies cannot be diagnosed using SPT. Are there any alternatives to a skin prick test? Yes. The amount of allergic response in your body against allergens can also be measured with a blood test. However the blood test results take approximately 2-3 weeks to return and there are greater costs involved. SPT results are seen 15 minutes after the test is performed. These tests show the presence of the IgE antibodies. If these tests are negative an immediate type allergy is almost always ruled out. Because the tests show the allergy antibody, they will start to be reactive (more than zero) when the person is sensitised (see above). A test that is “reactive” does not automatically mean that the person is allergic, it means the person has the potential to be allergic! The larger / higher the reaction is, the more likely it is that the person is truly allergic to that allergen rather than just being sensitised. The results of the test must be carefully compared with levels that have been shown to be truly positive, rather than just a little raised (reactive). For breathed in (aero-) allergens, a level of 3mm or more is usually considered definitely positive. For food allergens the “positive” values vary between foods and at different ages, but are usually much higher than for aero-allergens. In some cases the test cannot give the final answer and other tests may need to be done. 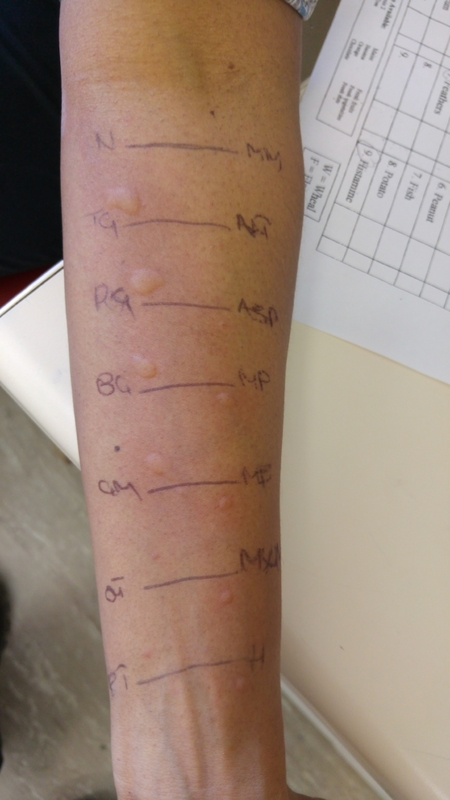 Allergy tests are a guide to whether the person has the potential to be allergic but they do not predict whether the reaction will be mild or severe. If you/your child is taking antihistamine tablets or syrup they need to be stopped before the appointment as they may interfere with the test. Most antihistamines should be stopped 3-5 days before the allergy skin test is done. If you/your child suffers an allergic reaction prior to the appointment you should still treat them using antihistamines if needed, and the test can be delayed. SPT should not be performed if you/your child is wheezy. Please let the nurse or doctor know if the reliever inhaler has been used on the day of the appointment. SPT for allergens that are breathed in are done with specially made allergen solutions. For some foods there are also special solutions available, but for some foods they are not available. Also, sometimes the actual food works better as a SPT than the extract. Ask the doctor whether you will need to bring any foods with you on the day of the skin test. The SPT is performed by placing a drop of the allergen on the skin (usually the forearm or upper back). 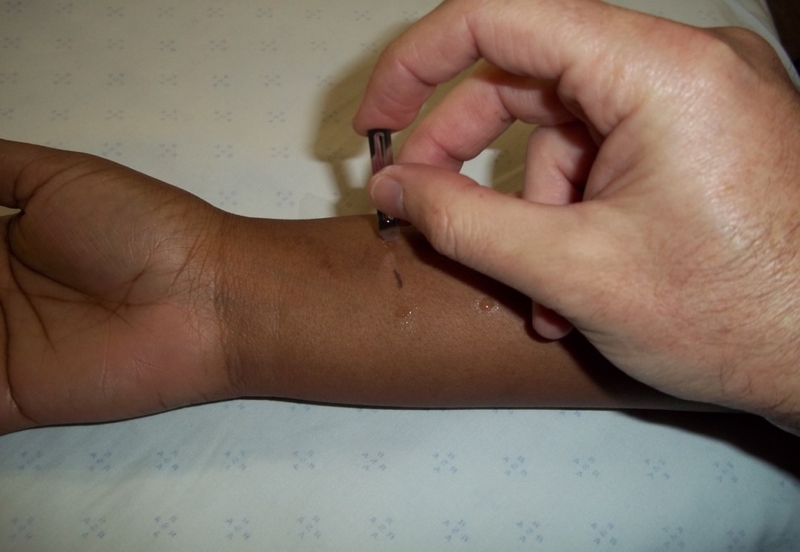 A lancet is then used to prick the top layers of skin through the drop so that the allergen is introduced under the skin surface. The drop is then wiped away. This process is repeated for each allergen requiring testing. After 15 minutes we look at the skin for signs of a reaction. A negative reaction is when the skin remains normal. If we see a white wheal (also sometimes called a hive; a bump similar to that seen in an insect bite) surrounded by redness (also known as ‘flare’) we measure it to see how large the reaction is. This wheal will disappear within 30-60 minutes. To make sure the test is working properly we always do a test to histamine in one of the drops. Remember histamine is the chemical released from the allergy cells and that causes symptoms? So everyone should react to the histamine test … this is normal. Skin tests may be slightly uncomfortable, but are usually well tolerated, even by small children and infants. Skin prick tests may cause very mild discomfort when the skin is pricked. If the test comes up positive the wheal may feel itchy for up to 20 minutes. Once the test has been read, a cold compress can be applied or some antihistamine given. The results of the SPT may be negative, slightly raised or clearly positive. The result must always be discussed with the doctor or specialist nurse for advice as to what the test means and what the implications are. Typical reactions are the wheal and flare at the site of the test that was described earlier. Reactions from the allergens after the test are rare. The itch and swelling normally goes away within an hour. Very occasionally patients will feel dizzy or light-headed and need to lie down. Severe allergic reactions from allergy testing are extremely rare. If you/your child has any generalized reactions after the test such as hives (urticaria, bommels), wheeze or a generalized itchy rash please contact your GP or emergency department straight away.